The ancient parish comprised the townships of Treflach, Mostyn & Hendreunig, Llansannan, Rhydeidon, Beidiog, Penaled (or Pennant Aled), Llysaled, Archwedlog, Chwibren, Hescin, Deunant, Arllwyd, and Grugor. 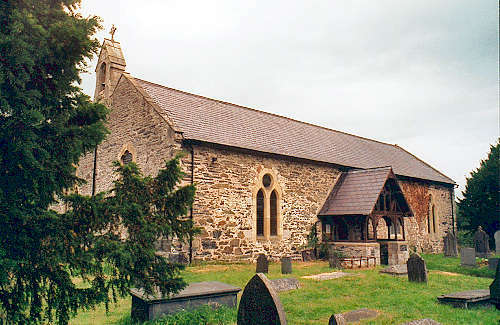 On 21 July 1855, the new parish of Bylchau was created; and the township of Grugor, with portions of Archwedlog and Deunant were transferred from Llansannan to Bylchau. The church was founded by St. Sannan, an Irish saint and bishop; and was mentioned in the Norwich Taxation of 1254. It was partly rebuilt in 1778. It was restored in 1878/1879, being re-opened on 12 June 1879. For family history information about the church and parish, visit the GENUKI Llansannan page.